"We went into the garden and drank tea under the shade of some apple trees; only he and myself. Amongst other discourse...the notion of gravitation came into his mind. 'Why should that apple always descend perpendicularly to the ground,' thought he to himself...as he sat in a contemplative mood. 'Why should it not go sideways or upwards, but constantly to the earth's center?' Assuredly, the reason is, that the earth draws it. There must me a drawing power in matter, and the sum of the drawing power in the matter of the earth must be in the earth's center, not in any side of the earth. Therefore does this apple fall perpendicularly, or toward the center. If matter thus draws matter, it must be in proportion to its quantity. Therefore the apple draws the earth, as well as the earth draws the apple." 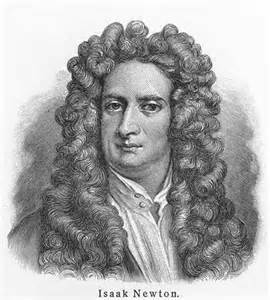 Newton received widespread acclaim for his work within his own lifetime, but he himself was relatively modest about his own accomplishments. In a letter to Robert Hooke in 1676, he wrote: "If I have seen further, it is by standing on the shoulders of giants." (an apparent reference to the likes of the three aforementioned scientists). From a personal standpoint, it's my opinion that only Archimedes and Einstein deserve to be in the same league with Isaac Newton.